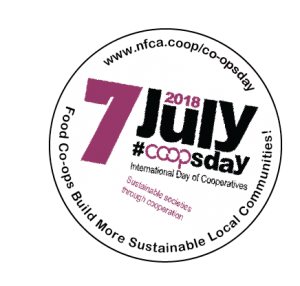 This year’s International Day of Co-operatives, observed on Saturday, July 7th, is focused on Sustainable Societies through Co-operation. Celebrated annually by the United Nations (UN), the Day is an opportunity to promote the role of co-ops in building global peace and security, as well as a reminder to co-operatives and credit unions to consider how we can do more to contribute to sustainability. How did co-ops come to play such a central position in international development? Co-ops are businesses that are owned and democratically governed by their members — the people who use them to provide themselves with products, services, and livelihoods. This unique structure means that co-operatives are rooted in their communities. And because they are designed to meet the needs of their members rather than maximizing short-term profits, co-ops are more sustainable. While the co-op model is well suited to building stronger local communities, the movement has been international in its vision from its beginnings. For example, Robert Owen, often described as the “Father of Co-operation,” traveled extensively to share his vision for utopian villages based on the community he developed at New Lanark, Scotland (now a UNESCO World Heritage Site). But it was the founding of a small food co-op in 1844 by working people in the North of England that enabled the movement to grow globally. By establishing the core co-operative principles, the Rochdale Society of Equitable Pioneers provided the framework for what has become one of the largest social movements in the world with over one billion members. As Johnston Birchall notes in “The International Co-operative Movement,” co-op activists had begun exchanging ideas across borders by the 1850s. As communities across Europe struggled with the impacts of the Industrial Revolution, co-operative ideas took root and grew rapidly in response the local needs. While consumer co-operation became the dominant model in the UK in response to rapid industrialization and the challenges faces by working people, credit unions first emerged in Germany among rural farmers and urban artisans. In Denmark, small independent family farmers used co-ops to compete with large producers and processors. And in Italy, France and Spain, worker co-ops became an important tool for creating sustainable jobs in the face of increasing globalization. From these early experiments, co-ops have spread to every corner of the world and every part of the economy. In 1895, activists gathered in London founded the International Co-operative Alliance (ICA) for the purposes of sharing information, promoting co-operative principles, and establishing commercial relations among co-ops in different countries. The ICA was particularly successful in helping to establish legal statutes in countries around the world, enabling people to incorporate co-operative enterprises. From the beginning, the ICA held an international perspective, including a commitment to democratic economic development and global collaboration as keys to world peace. In this sense, it is not surprising that the Alliance developed a relationship with the United Nations (UN) early in its history. Founded in 1945 in the wake of World War II, the UN was established with the primary goal of promoting international peace and security through of conflict prevention, human rights, and economic development. A year later, the ICA became the first non-governmental organization to be granted consultative status with the UN. Over the decades since its founding, the UN has worked with the ICA to identify common objectives. In 1968, the General Assembly tasked its Economic and Social Council with considering the role of co-operatives in economic and social development. And in 1971 the Joint Committee for the Promotion of Agricultural Co-operatives was created, reflecting concerns about global food security. Over the years, the scope of this committee has been expanded until it was given its current name, the Committee for the Promotion and Advancement of Co-operatives (COPAC), in 1989. In 1992, the UN General Assembly accepted COPAC’s proposal to adopt the International Day of Co-operatives, celebrated by the ICA since 1923. The first joint observation took place in 1995, commemorating The ICA Centennial and the Next 100 years of International Co-operation. Celebrated annually on the first Saturday in July, Co-op Day has focused on a wide variety of issues, from globalization to employment, empowering women to engaging youth, peace-building to microfinance, and economic equality to social inclusion. Your local co-ops and credit unions play an important role in enabling people to meet their own needs and build stronger, more sustainable communities. And together, they are part of an international effort to make the world a better place today, and for future generations. For more information on International Co-ops Day, visit http://www.copac.coop/day-of-cooperatives/. Erbin Crowell is Executive Director of the Neighboring Food Co-op Association, serves on the Board of Directors of the National Cooperative Business Association, CLUSA International (NCBA CLUSA), and is an adjunct lecturer with the UMass Amherst Department of Economics where he teaches courses on the co-operative movement.